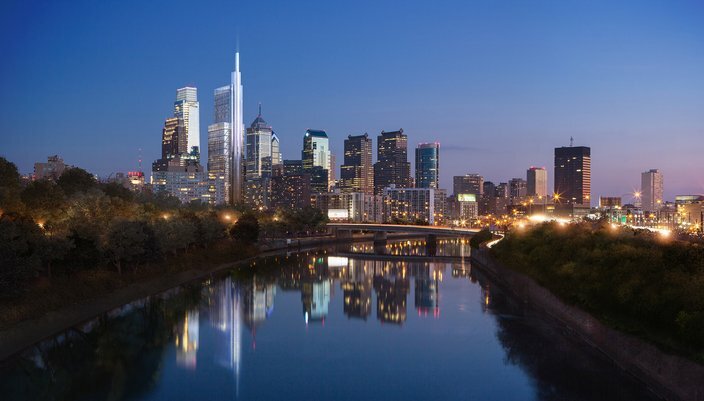 Is Philadelphia finally getting the skyline it deserves? The Comcast Innovation and Technology Center certainly cuts a striking figure. If a city is defined by its architecture, then Philadelphia's rich design writes a complicated story. Our Georgian 18th century rowhomes are flanked by Brutalist 20th century towers. Our Second Empire-style City Hall overlooks the nation's first International Style skyscraper. Our Art Deco-inspired skyline now competes with modern pedestrian parks and plazas. This mosaic of styles at once reinforces history and exudes elegance, commands obedience yet exemplifies innovation, makes us glance skyward but keep our feet on the ground. It's a complex message, sure, but it's a strong one, one of continual evolution. It's no state secret that Philadelphia is going through a bit of a growth spurt. Our population is slowly growing after a post-industrial suburban exodus drained the city in the second half of the 20th century. We continue to be acknowledged in those buzzy and somewhat arbitrarily composed lists of cities being good at stuff. We're attracting A-list attention to conferences for up-and-comers and being praised for our food scene. Perhaps most importantly, we're in the midst of a development boom, and a few new projects are poised to have a significant impact on how we - and others - view Philadelphia. The most obvious, and perhaps the most highly anticipated, is the Comcast Innovation and Technology Center. The massive 59-story tower at 1800 Arch St. will be home to employee spillover from the Comcast Center, two TV stations and a Four Seasons Hotel. Expected to be complete by fall 2017, it will also feature a pedestrian concourse with restaurant space and access to Suburban Station. 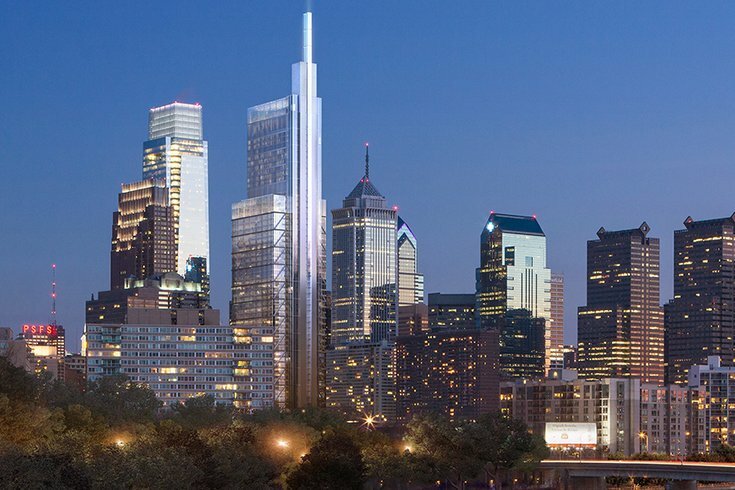 The Norman Foster-designed tower will alter Philly's skyline, too. A skyline is an integral feature of a sprawling city like this one, at once marking its center and creating a backdrop for surrounding urban life. The buildings defining it can be seen for miles and, therefore, become symbolic of the city itself. A decades-old gentleman's agreement suggesting all buildings remain shorter than City Hall kept ours pretty shapeless until One and Two Liberty Place shot up in the late '80s. All shimmering glass and geometric designs, they set the tone for a city that was attempting to re-establish itself as a center for modern industry. As if in response, the white and red granite exteriors of the Mellon Bank Center and the Bell Atlantic Tower that sprang up in their wake recalled the city's historic architecture instead. This mosaic of styles left Philly’s skyline with one foot in the past and one in the future. Comcast changed all of that in 2008 with a shiny glass structure that set both feet firmly in the new millennium. The one-two punch of a second, complementary tower will certainly make a statement for the company, and for the city. For Harris Steinberg, the former founding director of PennPraxis, the University of Pennsylvania's applied research arm, and the current executive director of Drexel University's Lindy Institute for Urban Innovation, its message is clear. "It's going to say 'tech,'" he said. "That’s going to be the image," Steinberg said. "It’s going to become our Eiffel Tower for the next however many years. I think the message that’s going to be going out from Philadelphia is that this is a city that is serious about its future." This forward-thinking message establishes itself in the building’s striking exterior and strategic interior. Whereas many skyscrapers leave their elevator core in the center, this tower’s core is at its western side. This allows the building to have spacious floor plans. As Foster said in the statement announcing the tower, “the highly flexible loft-like spaces and studios are designed for a dynamic way of working – an engine for the city’s evolution as the kind of leading technology hub presently associated with Silicon Valley.” The intention behind this design is clear; Comcast, at least, wants Philadelphia to become the next great tech city. Perhaps most significantly, though, the way Foster topped the west-facing elevator tower with a crown of illuminated blades of glass signals something else. By pointing toward West Philly, it mirrors a resurgence of development on the other side of the Schuylkill, complete with its own new skyscraper. The FMC Tower, on the left, certainly makes an impact on the West Philadelphia skyline. Pelli Clarke Pelli/Brandywine Realty Trust. 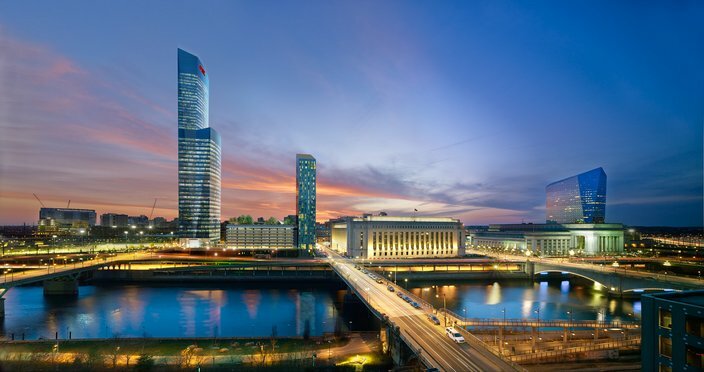 The FMC Tower at 30th and Walnut streets, designed by Pelli Clarke Pelli Architects as part of the Cira Centre complex, should be completed by spring 2016. It will include 49 stories of retail, office and residential space next to an elevated park, a sort of “vertical neighborhood.” The addition of a skyscraper - and the home of FMC, a major chemical corporation, at that - changes the conversation around its home, University City. Building high-density office space in an area largely known for eds, meds and residential neighborhoods also has the potential to encourage the others to sprout up. If one Fortune 500 company is willing to make its big, shiny home here, others will too – or at least, that’s the idea. Steinberg and the Lindy Institute hope it will spur the development of what they call an "innovation neighborhood." Steinberg said these 10 acres between 30th Street Station and Drexel's campus, eventually to be filled with academic, residential and commercial space, are "the big game in town." If and when this fill-in occurs, Steinberg said, "[it is] going to be knitted back into the city, making this a continuous Center City from the Delaware River to 40th Street in one whole swoop." "If we’re successful, and I believe we will be, it will have a transformative effect on the city of Philadelphia, not only in terms of the skyline, but in terms of the identity," Steinberg said. That identity would shift from that of a former industrial city economically devastated by suburban sprawl to that of a dense, pedestrian-friendly metropolis. It would mark a sort of return to a time where Philadelphians lived, worked and kicked back in the same neighborhoods, rather than commuting in and out each day. A tightly knit city in this case includes an overhaul of the Delaware River waterfront, a vision Steinberg led at PennPraxis. 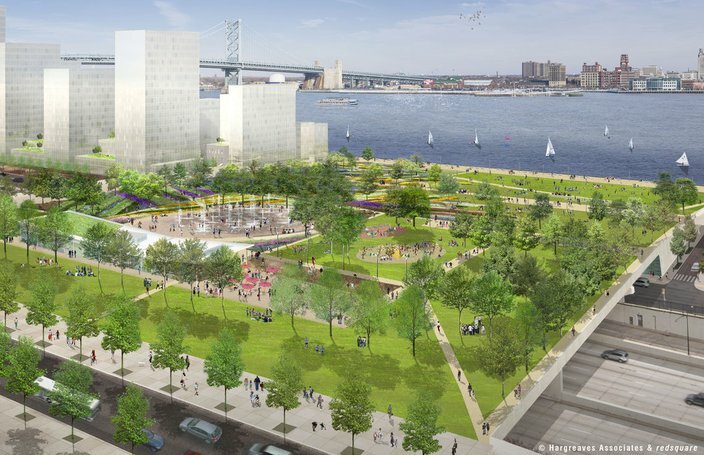 For the past few years, the Delaware River Waterfront Corp. has been slowly but surely implementing a master plan for its development with significant input from the community, including the creation of its crown jewel and keystone, a riverside Penn's Landing Park. Using a feasibility study, the DRWC determined the park can safely exist in a variety of hypothetical landscape designs that, as of yet, are a few years from being implemented. The idea, though, is that the DRWC will create a welcoming, open, public space and private development, both commercial and residential, will follow. Essentially, it's "if you build it, they will come," but with less baseball. The architectural landscape of the park will definitely be mixed-use and could become home to everything from an outdoor concert area to recreation on the water. Considering the popularity of Spruce Street Harbor Park and Winterfest, the DRWC knows what kind of space the public enjoys and that it’s yearning for more. Karen Thompson, a DRWC planner and the project manager of the feasibility study, understands the public's concern that plans like these are too good to be true. "Seeing the Penn’s Landing concept come to life, to have that actual kind of permanent connection between the rest of the city and the waterfront, is something they’ve been trying to do for 30, 40 years now," Thompson said. "I think finally having that done ... I think that, psychologically, would be a huge." Now, imagine if the physical barrier (and eyesore) of I-95 were rerouted, opening up Market Street and allowing us to walk across an open park and right into the water on a sunny day. Such a connection to nature could certainly change Philly’s identity as an urban jungle. 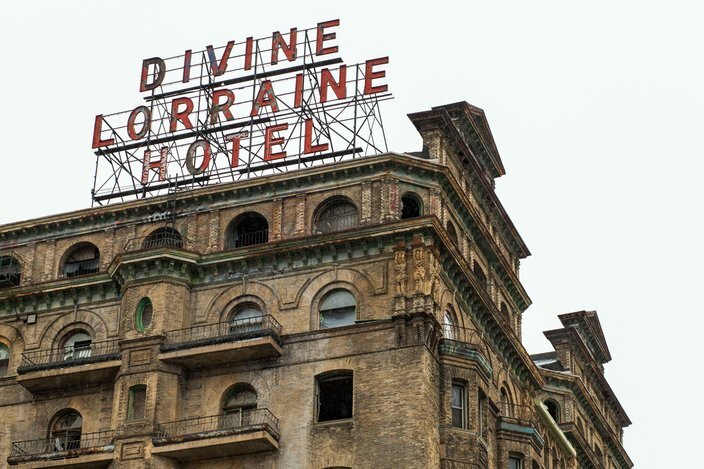 Of course, large-scale projects like this, and even the (eventual, hopeful) refurbishment of that architectural marvel called the Divine Lorraine, can serve as catalysts for the rehabilitation of neighborhoods that could stand to see more life and prosperity. Or, they can signal the onslaught of gentrification. New skyscrapers and public spaces are creating a new identity for Philadelphia through architecture, and they can do a lot of good for the city’s global image. But Philadelphia must also grapple with its inequity and poverty if it is to succeed as a truly modern international city. Sure, new developments are enticing to industry leaders looking for a home, but Philly is still one of the nation's largest poor cities. Though the city has instigated some property tax reform to aid homeowners, renters still feel the negative effects when skyscrapers loom over their neighborhoods. "Will the unintended consequences [of change] now drive out those folks who are the least protected, which will ultimately make us a less diverse, less innovative, competitive city?" Steinberg said. Architecture, as a profession, must ask that question, he said. Developing spaces for low-income housing, not just luxury apartments, is crucial. An influx of sleek, mixed-use, high-density developments and public spaces will certainly change how Philly looks in 10 years. By 2025, Philly will look modern, open and ready for the future. As long as we focus on helping the whole city rise together, we should feel like it, too.